Nice, right? He would not stop walking from one side of the room to the other. All in his pamper and Super Sleuth sneakers. 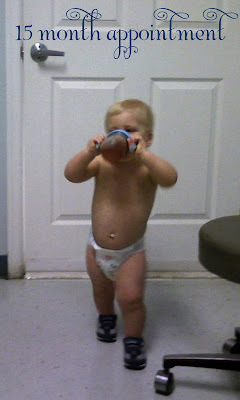 Oh, and lets not forget the sippy cup which left a nice combination of drool and apple juice trickling down his belly. Carter had his 15 month well-visit on Friday, where he received several shots, including the flu vaccine and the dreaded MMR shot. We also found out that he only gained 3oz from his last appointment 3 months ago!! My man is on the move, lol. He is getting skinner by the day and you can even see his stomach muscles sometimes. What happened to my buddah baby??? I knew this would happen though... I was the same way as a baby... started off at 10lbs and barely weighed 30lbs by the time I went to kindergarten! What a big boy!! He's adorable! Thanks Erin! You made me feel much better!